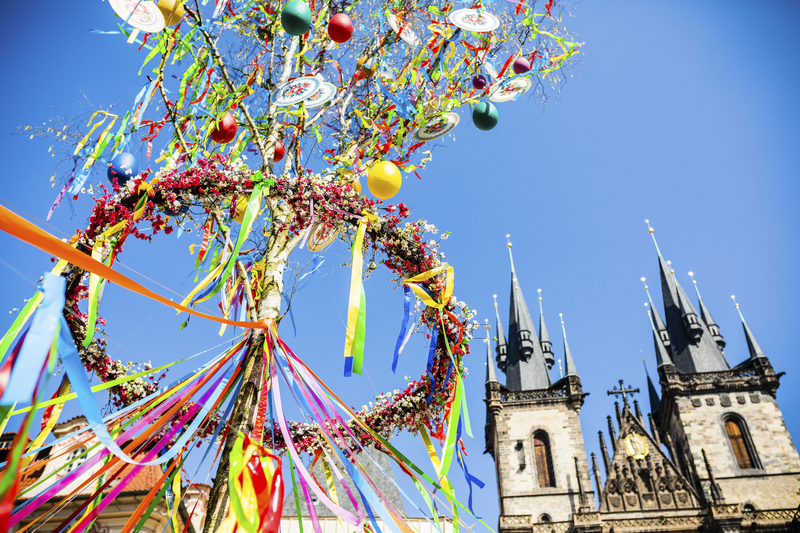 The largest and most famous Easter markets in Prague. The market features wooden stalls decorated with the bright colours of spring, flowers, ribbons and ornaments of animal babies. They are stocked with handicraft products such as embroidered lace, wooden toys, ceramics, scented candles, puppets, and Easter eggs. The square is livened up by blossoming apple trees, boxes with live flowers, two-meter-long wicker eggs, and a viewing bridge. The accompanying programme traditionally focuses on old Czech customs and traditions, including concerts of children’s choirs and folk-dance performances. It starts at 4 p.m., finishes at 7 p.m. every day. Children can look forwards to workshops which take place during weekends. There is a small playing corner for them too. Food lovers can taste meat skewers, steaks, grilled sausages, homemade cheese, gingerbread, marzipan, Czech Easter specialities such as mazance (Easter sweat bread) and more. Food lovers can rakes meat skewers, steaks, grilled sausages, homemade cheese, gingerbread, marzipan, Czech Easter specialities such as mazance (Easter sweat bread) and more. All of the refreshment is served into compostable dishware. There are BigBelly ecological bins. Information source: Taiko, a. s.